The blue dot in the center of the parallelogram is me (or you!). Each of the dots on the corners represent different archetypes that we can follow. But we can get quite a bit more evil. If we perform violent actions, we travel right in the diagram. This takes us to Judas. Judas came with armed men to capture and kill the innocent Jesus. By using violence in this way, we can bring about quite a bit more evil than by doing nothing. 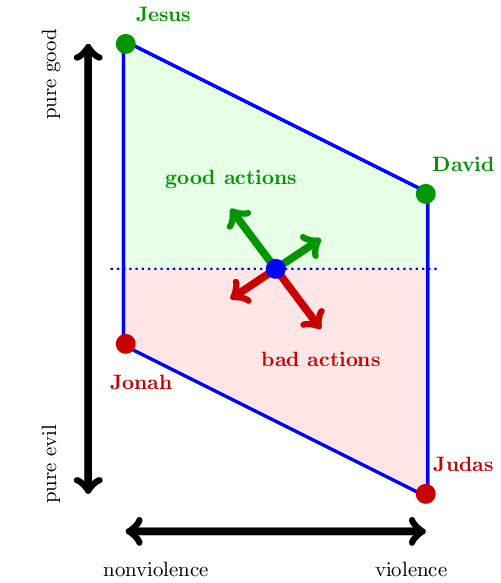 That is why Judas is farther down in the diagram than Jonah. The farther down you are, the more evil you are. But not all violence is created equal. 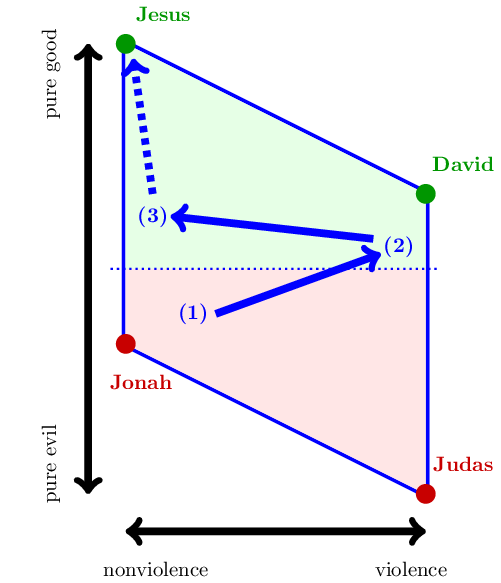 If we travel up from Judas, we get to David. David was a king of Israel and is considered one of the most righteous people of the old testament. He used violence to protect the innocent. When a soldier kills a suicide bomber before the bomber can kill innocent civilians, the soldier is imitating David. The soldier has risked his own safety and done a good thing. But it was not the best thing. If we travel again to the left in the diagram we come to Jesus. Jesus did not use violence, and he embodied all that is good in the world. When the devil gave Jesus the opportunity to use violence to stop evil people (Matthew 4:1-11), Jesus chose a better path: He sacrificed himself for those evil people. He died on the cross. While violence may be useful in protecting the innocent, it is useless when saving the guilty from themselves. This is a much harder (and in the Christian perspective much more righteous) task. That is why Jesus is higher in the diagram than David. Example 1: Let’s rethink the story of David and Goliath as told by 1 Samuel 17. The Philistines are invading Israel, and are camped inside the borders of Judah. Every day, the giant Goliath comes forward and challenges the Israelites to single combat. At this point, the Jonah option would be to hide in the ranks. Jonah would depend on someone else to save the Israelites. The Judas option would be to secretly meet with the invading army. Judas would help the Philistines kill the Jews in the hope of escaping a similar fate. Enter David. David was brave. He chose to fight the Goliath single handedly. He wanted to save his friends from doom, and this was a good thing. But it was not the best thing. What would Jesus have done? I can’t know for sure, but I can speculate: I think Jesus would have helped the Philistines. He would have delivered them water and food. He would have healed their wounded and cared for the widows and orphans left behind. Jesus would have been willing to die not just for the Israelites (like David), but also for the Philistines. What greater love is there than that!? Notice that I don’t consider myself more righteous than David. In fact, I firmly believe that there have been violent people more righteous than I am! Nonetheless, my calling is to be like Jesus. That means striving for something better than David. My new goal is to follow the dotted line… to change the world by offering myself as a living sacrifice. I fail every day. But with Christ’s grace, I find renewed strength to keep trying. That is why I call myself a Christian pacifist.